Crane hooks and wires first. I didn't like Amati's way of doing these. Having the wire and hook all made from the same bit of wire looks daft. The wire should be much thinner than the hook. Here's what I did. Hooks. I bent these out of 15 amp fuse wire. 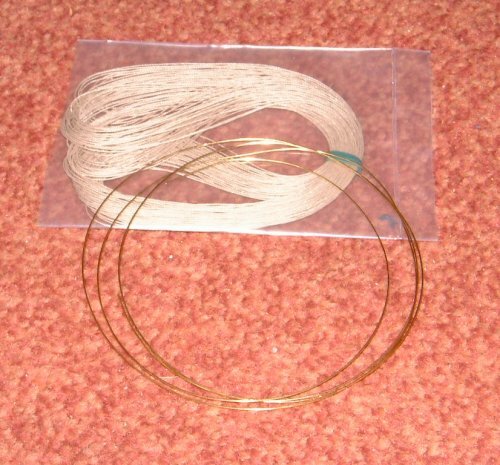 This is about the same thickness as the brass wire supplied, but is much softer and easier to work. First, I put a couple of tiny nails into a bit of wood. These were some left over tacks from planking the hull, and I cut their heads off. These were placed close together - so I could just get the wire between the two nails. 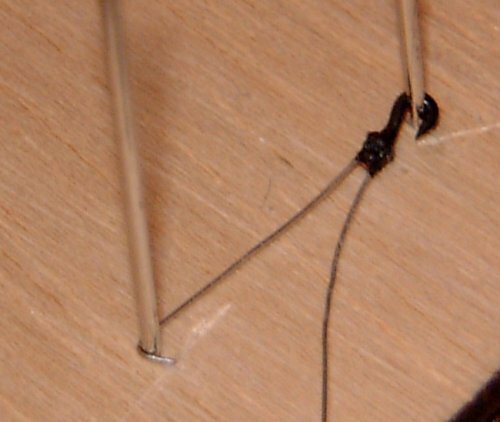 Then I took a length of fuse wire, placed it between the nails, and bent it into an S shape. See the right hand side of the photo. 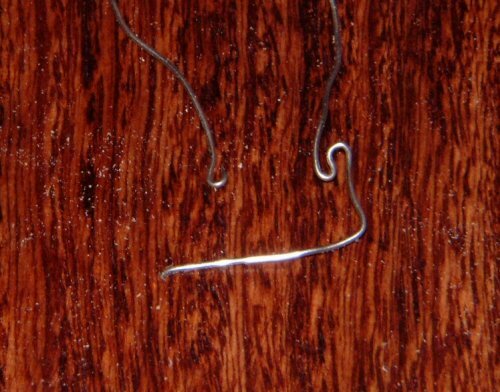 Then I placed the wire on a hard surface, and cut off one side of the S to give me a hook shape. See the left side of the photo. This was then tweaked a bit to improve the shape. Next I cut off the excess from the shank of the hook, and tied some 5 amp fuse wire round the end of the shank and pulled it tight. 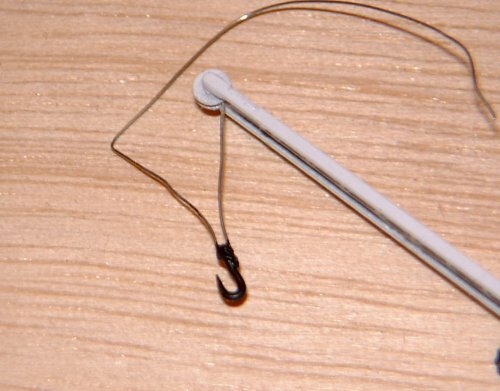 It doesn't tighten up enough to grip the hook tightly, but it's good enough to hold itself in position as long as you handle it carefully. The next task is to fold the wire up, and apply a blob of thick super glue. I shall run one wire up to the back of the pulley in the top of the jib, and one over the top of the jib and back to the 'head' of the crane. 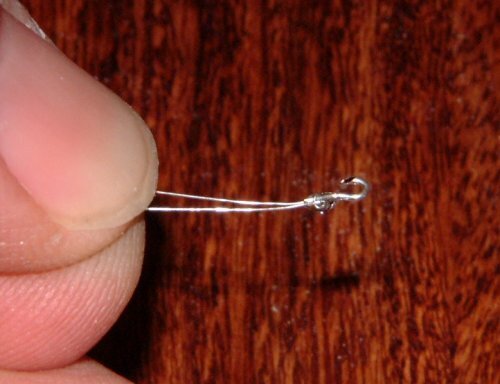 The blob of superglue represents the thick end of the hook that would have carried a pulley. 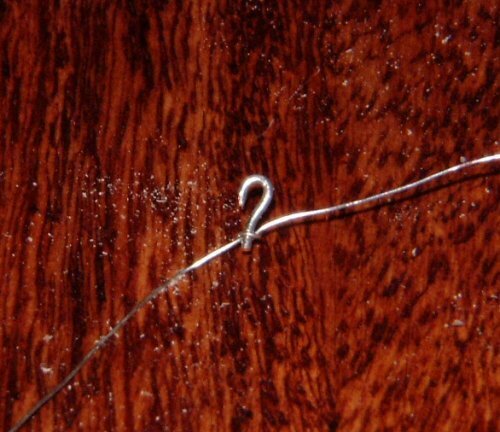 The picture above shows how I cut the wire at an angle to suggest a tapered point to the end of the hook. I made about a dozen of these and picked the best looking ones to use. They all looked a little different. The next step is to paint the hooks black. I have to admit, I'm quite pleased with them. It's worth doing a few extras so you can pick the best. Some look very good - some don't. Now, how to fix the hooks and wires to the crane. Two problems. How to fix them, and how to make them all the same length. Both solved with one process as it happens. 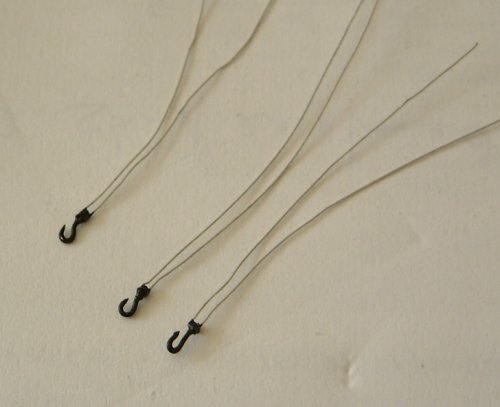 it's obvious that you need a jig of some sort to get the lengths all the same. I decided to make a jog from two needles pushed into a sheet of ply. Hook the hook in one, and bend the wire round the other. Bend one side, and cut it short. This will be the inside wire, and will go over the jib wheel. Bend the other round the needle and leave it long. This will form the wire that goes to the crane body. This shows the first wire attached. Fix it with super glue. This shows the completed crane. The wire is bent over the end of the jib, glued in place (super glue) and then bent so that it rests in the groove in the crane body casting. 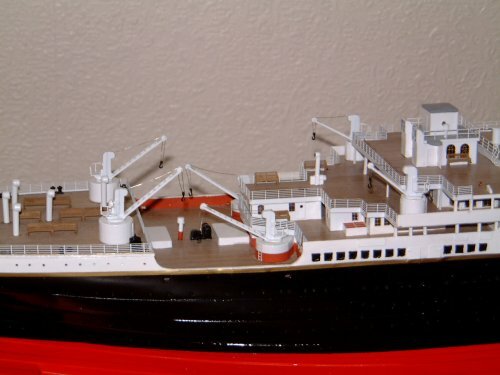 Because all the bases were slightly different shapes (or at least, not perfectly round) and because I'd spray the cranes and pedestals, they wouldn't fit easily. This was rectified by removing the paint and enlarging the recess in the pedestals slightly with a hobby drill (Dremel type tool). The cranes were all fitted individually, and you can just see the No 5. on the bottom of the crane above identifying it's position. The cranes have been glued in place with Epoxy glue. 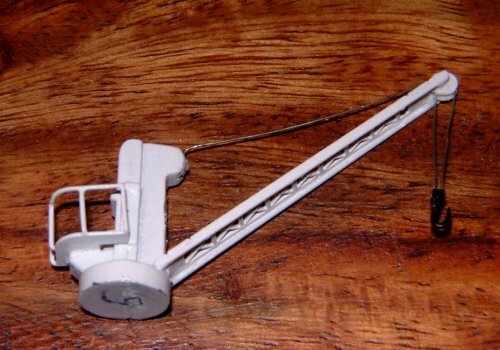 Things like these crane hooks are very fiddly. It's entirely up to you if you decide to fit the the parts as Amati provided, improve them as I have done, or spend even more time and make a better job than I have done.